Even though awareness on betta fish care seems to be slowly spreading, both pet stores and the internet are still an enormous source of misinformation. Betta bowls, vases and ridiculously small “aquariums” are still sold on a large scale, which means many unfortunate bettas die a premature death due to bad housing. Don’t be fooled by their size – even though bettas are very small fish and often quite cheap, they still need to be kept in a heated, filtered aquarium to thrive. Keep reading to see some of the most common betta myths smashed and find out just why a bowl, vase or very small tank is not enough to keep your betta healthy in. Myth: Bettas in the wild live in small muddy puddles and even animal footprints. They like dirty water and small spaces. False! While the water bettas live in sometimes seems muddy due to its darker color, it’s actually stained by plants and fallen leaves. They are not “used to” dirty water: a filter and water changes are necessary. Although the water is often quite shallow, the rice paddies and streams bettas naturally occur in are actually huge! Your betta will not “freak out” in a larger space. If it does, you should add more hiding places in the form of plants, rocks and decorations. Growing live plants can be intimidating, but luckily there are many beginner plants such as Java fern that help a betta feel safe. Myth: Bettas can survive in vases eating plant roots. False! Bettas are carnivorous surface feeders that mostly eat fallen insects. When kept in a vase with only plant roots to eat, a betta will starve. The plant roots may also block the surface, making it impossible for your betta to reach the surface to breathe! Breathing air is necessary for your betta to survive, so it should always be able to reach the surface. Myth: An “aquaponics” system is a good way to keep a betta in a tiny container because the plants will remove wastes. False! There is no excuse for keeping your betta in a very small unfiltered container. Proper aquaponics systems, where plants are grown on top of the aquarium using the wastes from the fish as fertilizer, can be a fun project. However, the tiny “aquaponics” tanks that seem to be all the rage because they claim to make water changes and cleaning unnecessary, are little more than betta death traps if you use them as advertised. Cleaning, heating and filtering is always necessary! Myth: Bettas are not tropical fish so they don’t need a heater. False! Bettas naturally occur in Thailand and Cambodia, where it actually gets really hot. This myth was created to make impulse buying a betta more attractive. If you keep your betta in temperatures below 76 °F/24, 5 °C, you will quickly notice it becoming lethargic due to the cold. A heater is 100% necessary unless you have a fish room with a stable, high temperature. The myths are proven false: bettas can’t live in bowls, vases and tiny containers. But why not? So many sources say it’s okay – what could possibly make this kind of housing so bad? The first and most important reasons are water values and temperature. In a round bowl, adding a filter and a heater is almost impossible, and they will take up much of the already very small space. Getting a square vase or tiny aquarium that can accomodate this equipment is unfortunately not a better option. The filter will be mostly ineffective in breaking down ammonia and nitrite: establishing a stable cycle in such a small amount of water is almost impossible and water values will constantly fluctuate. The alternative, very frequent 80-100% water changes, is stressful for the fish unless you work with a drip system in a bigger fish room (which is what many betta breeders do). As mentioned before, adding plants is unfortunately not a good replacement for a filter either, as they are not able to remove the wastes a betta produces. 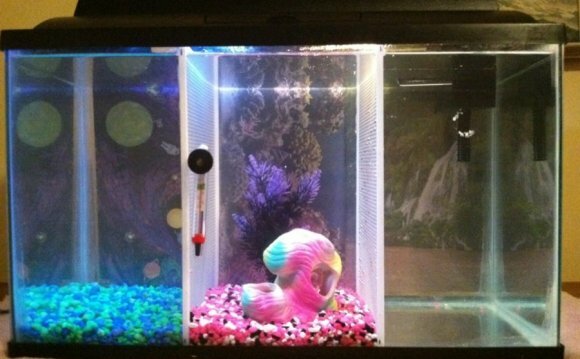 Since betta bowls cannot be filtered, problems with keeping your water values stable will arise. Even if you work very hard to keep your betta bowl/vase clean, an ammonia spike can occur very quickly and without you noticing.